The Well-Appointed Catwalk: Giveaway: Win a Custom Clutch from Sew Sarah R! 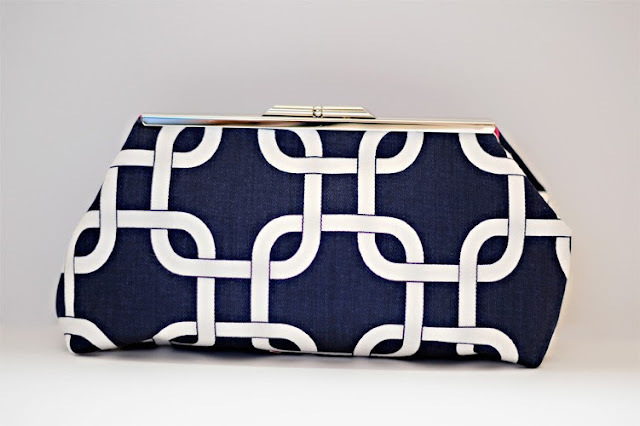 Giveaway: Win a Custom Clutch from Sew Sarah R! Nothing does justice to a little black dress quite like a pop of print, so in the midst of wedding season, I'm turning to Sew Sarah R. The local lady behind the brand, Sarah Ramondt, launched her line of colorful clutches last year, when a search for personalized bridesmaids gifts eventually landed Sarah at her sewing machine. Now, Sew Sarah R offers custom clutches in any combination of 61 fabrics, three frame styles and five frame colors with personalized interior labels. There are even options to add a photo-print liner, monogram or purse chain. But not to worry if you're feeling overwhelmed by choices: There are plenty of ready-made clutches for sale, as well. To enter to win your own custom clutch from Sew Sarah R, make sure you're following The Well-Appointed Catwalk via RSS, email, Facebook or Twitter, and then leave a comment below describing the clutch you would design. For extra entries, share the giveaway on Facebook and/or Twitter (for a maximum of three entries total), and leave separate comments for each entry below. The giveaway will remain open until the end of Monday, July 22, at which point I will randomly choose a winner. I "re-tweeted" the contest on Twitter! If I could design a clutch it would be be for a night out with maybe an animal print liner and sequins or sparkle on the outside! If I could design a clutch, I would also choose something purple (because that is my moms favorite color) and have her initials on it JLB. She is getting married this Summer and we would LOVE to win a clutch for her and I wish I could win matching ones for her best friend (Tina Schlief) and myself. These are just ADORABLE!! I LOVE them!! I repined it on Pinterest and also started to "follow" The Well Appointed Catwalk!! thank you!! hi! i follow via email (courtafi2138 at gmail dot com) and if i could design my own clutch,it would be a fun,everyday kind of clutch that would go with just about anything.i love the fold over style! I love the limoncello fabric w/ a black nickel frame. Seems like a sunny & great match for a lot of things! I would definitely do something on the same wave length as the first one! Very cute. oh i love custom!!! i would most likely choose the navy chains! 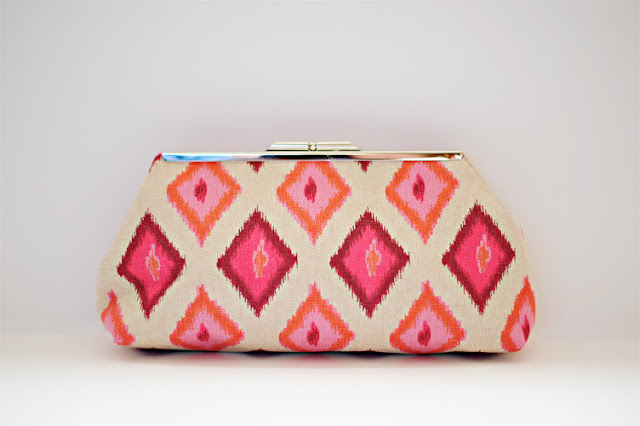 The pink ikat is fabulous! Always love discovering new Well Appointed Catwalk recommendations. Local? Hope the planning is going swimmingly! I would design something along the lines of the first clutch (super cute!) and maybe make the inside liner fun and sparkly. I'm leaning towards the Navajo Lavender :) I love that you have the option to add a chain too! Ooh so cute I'd love to design a clutch in a fun bright pattern in either the foldover style or the clutch mini style. So pretty! I also follow you on Twitter (roomofmyown) and RSS Yahoo. I follow on twitter and I would like to design an ikat print clutch. I'm following via Yahoo reader. I'd design a foldover clutch with a peacock exterior, yellow lining and navy zipper. Oh my gosh so hard to decide... I would go with the vintage black nickel frame (so lovely!!) with the Black Madison as my exterior fabric and a teal interior <3 I think I'm in love! following you on twitter (@swellswag) // I think I'd go with some sort of ikat design -- and I'm leaning toward navy as the main color. Oh! And, a monogram would be awesome! I think I would keep it simple! Grey monochromatic with a touch of yellow!! I shared the link on my fb wall!! thanks! I shared the giveaway on Facebook here: https://www.facebook.com/elena.vo.560/posts/500919069979821 and also told my friends from down the street about Sew Sarah R clutches. Loving the idea! 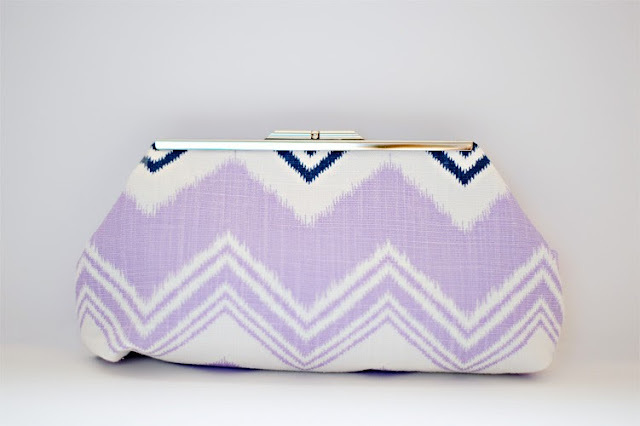 I would do the fold over clutch with one of the ikat prints! These are absolutely gorgeous! Mine would have the navy chain print with a modern frame!